Hi, everyone!! Today we are preparing for our first Indian vacation!! Beloved the Lhasa Apso will be getting a haircut at Paw Prints in Begumpet - then...tonight after she gets off of work (she's teaching a class all day!)... A. Suzanne and I finally begin packing for our FIRST Indian vacation together. Actually, to be completely honest...this is our first REAL vacation together in almost 13-years!! We have never been away on a true vacation (at least one that did not involve some sort of horse-show or Deloitte function!!) since we met each other in 1998!! Amy, of course, has shown horses all over the country and taken me along, and, thanks to my wonderful wife, I've had the incredible opportunity to golf in Scotland and Ireland...plus my yearly Highland Tinkers Triathlon trips.... but it seems we've never been able to "pull the trigger" on just packing our bags and going someplace just for us!! We go to the Bay Area to be with family for the holidays every other year....but - building and running the mission of St. Barnabas the Apostle (the website is still up for some reason, even though we've been closed now for over a year!!) made it so taking a vacation was next to impossible. Now that I'm in "semi-retirement" (Priests never really "retire" - hopefully they die at the altar at a ripe old age!) - it's time we started looking after ourselves a bit....so - here we go!! We leave in the morning from Rajiv Gandhi International Airport in Hyderabad - a really nice modern airport to fly in and out of. Our first stop is the great and ancient city of Delhi - and the Indian capital city of New Delhi, where we will stay for two days seeing the local sights: the India Gate, Humayun's Tomb, the Qutab Minar, the Red Fort and the Jama Masjid. We have booked a cycle-rickshaw ride through the bazaar....should be a nice blend of new and old!! 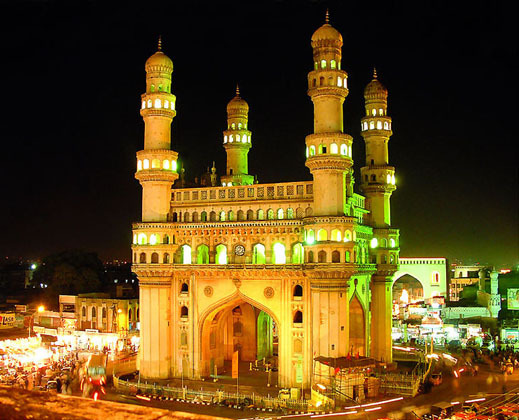 Then, the next day, we drive through the countryside (actually, some of my favorite parts of travel in India are the road-trips - - the sights and sounds of the areas outside of the cities are really wonderful breaks from the hustle and traffic of daily life in Hyderabad!!!) and arrive in Jaipur in Rajasthan. We will go out to Amber (pronounced ""Amer") to see the Amber Fort (where we will be riding an elephant!!! )...and then tour the great palaces and the Hawa Mahal. On Thanksgiving Day (this should be a memorable T'sgiving, even without the traditional turkey dinner!) - we will drive to Agra - and after we get settled in the hotel...we will get a sunset tour of the Taj Mahal (see photo, above left). I am going with no expectation, I really thought it might be just some touristy place (and I'm sure that it is, somewhat!) - but - everybody we've talked to says that the Taj is "all that" - - a really magical place that will stay in your memory-banks for a lifetime. Despite my first opinion....I am actually looking forward to it!! 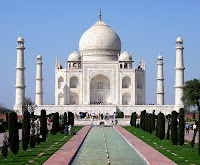 The second day in Agra we will see the Agra Fort and the Sikandra ("Akbar's Tomb") and have a free afternoon for shopping. I imaging we can find some first-rate Taj Mahal souvenirs. 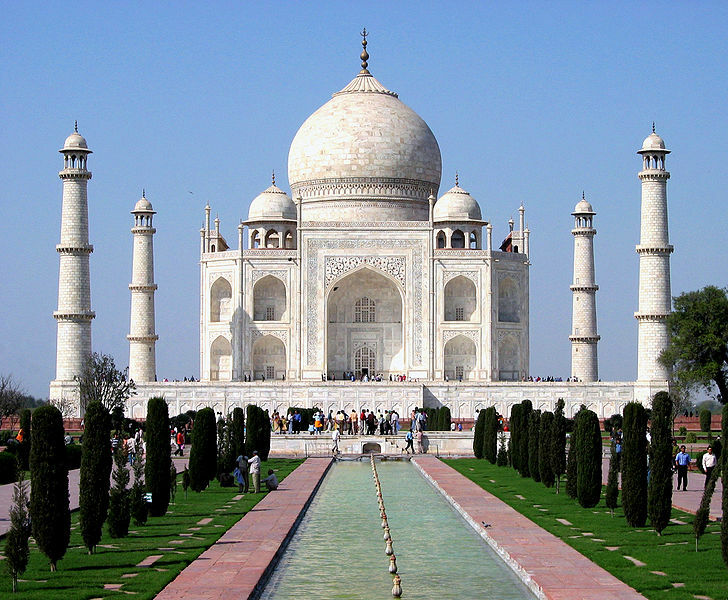 No, John Adams - - since the Taj is a Muslim site...I'm pretty sure I won't be able to find a Taj Mahal shot-glass for your collection...however - - I will certainly look!! We have an early breakfast on Saturday morning before the drive back to Delhi...where we will catch our flight to Amritsar and the Sikh Golden Temple (one of the few places I told myself I would not leave India without seeing!!) We will see the Guru Granth ceremony that night...and have most of the next day to explore the temple grounds and see the site called Jallian Wala Bagh - where the infamous "Amritsar Massacre" took place. If you saw the movie "Gandhi" - this was the horrifying scene where British General Dyer led his troops into the square and indiscriminately shot men, women and children...resulting in the deaths of 379 souls and injured more than 1,200. We'll see the Ram Bagh....the garden named in tribute to Guru Ram Das - along with the museum there. That evening - we will make the short drive to the Wagha Border (with Pakistan) to see the flag-lowering and border-closing ceremony. This ceremony is another of the things I promised myself I would see while I am in India. I hope that Amy Suzanne is looking forward to it as much as I am!! We will certainly have a blog-report.... and many, many photos to share when we return.... Also to come... on 2 December 2010 - we will have been here six whole months!! I can hardly believe it!! I'll have my Ten Point Report on our first half-year in Hyderabad. Amy asked me if it was O.K. for her to ask for an extension and stay for another year (for a total of three years!). I told her that if she wanted to stay for TEN YEARS, it would be just fine with me! !